Summer is the perfect time to host a rooftop party. 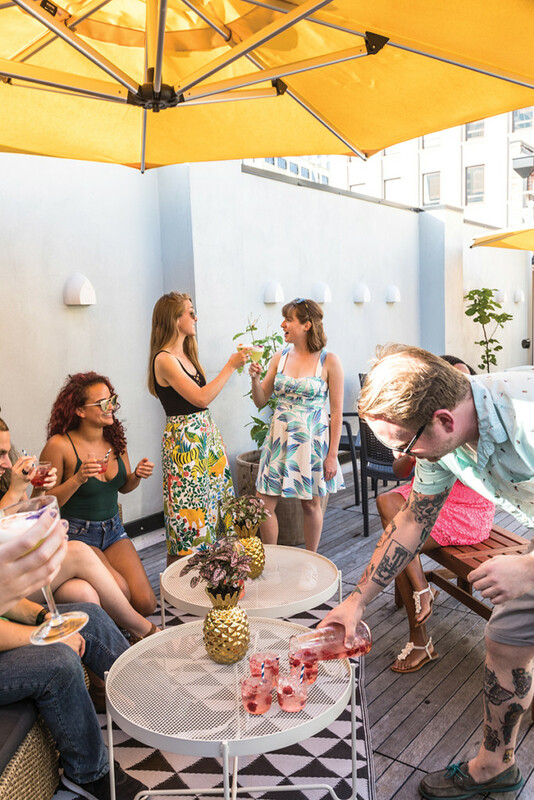 If you don't have a rooftop space of your own, don't fret, as New Orleans is home to several hotels and event spaces with elevated decks and patios to reserve or rent, making entertianing atop the city a cinch. The Catahoula Hotel is one such gem tucked away on Union Street in the Central Business District. Its laidback rooftop bar is an oasis with ample, lounge-style seating and the bar’s focus is on agave and rum, with cocktails featuring spirits from both categories. When Chef Melvin Stovall of the popular Midnight Noodle pop-up restaurant has a day off, he likes to gather a few friends together at the Catahoula Rooftop Bar. Midnight Noodle (facebook.com/midnightnoodlenola), with its ever rotating menu, is a fixture at both the Catahoula on Friday nights and Barrel Proof bar on Sunday nights. Stovall specializes in plant-based Asian dishes that are served family style. The menu for his friends, specially prepared for this feature, includes Extra Crispy Scallion Pancakes, Garlicky Smashed Cucumbers, Drunken Noodles and Smokey Bao. The mixologists at The Rooftop Bar prepared two summer cocktails to complement the dishes. A New Orleanian, Stovall was born and raised in a Creole family. “I probably learned to cook and walk at the same time,” says Stovall. He is well versed in all the New Orleans basics, jambalaya, gumbo and any dish one brings to a family gathering. The chef first got excited about cooking during a two-year stint in Los Angeles, where he first tasted Thai food and acquired a fondness for Sichuan peppercorns. “Eventually I’d love to open up my first restaurant concept in my hometown, but right now I plan on learning about the culinary world as much as possible through small research trips to Shanghai and Southeast Asia, and food projects involving learning how to use mushrooms as a more interesting plant food source." The Catahoula Rooftop Bar does not have a covered ceiling and is closed according to the whims of New Orleans weather. The hotel opens its kitchen doors to roaming concepts, Wednesday through Saturday evenings. The pop-up kitchen series features fresh takes on street food from Puerto Rico, Cajun Country, Korea and Taiwan, with a different corner of the globe represented each evening of service. 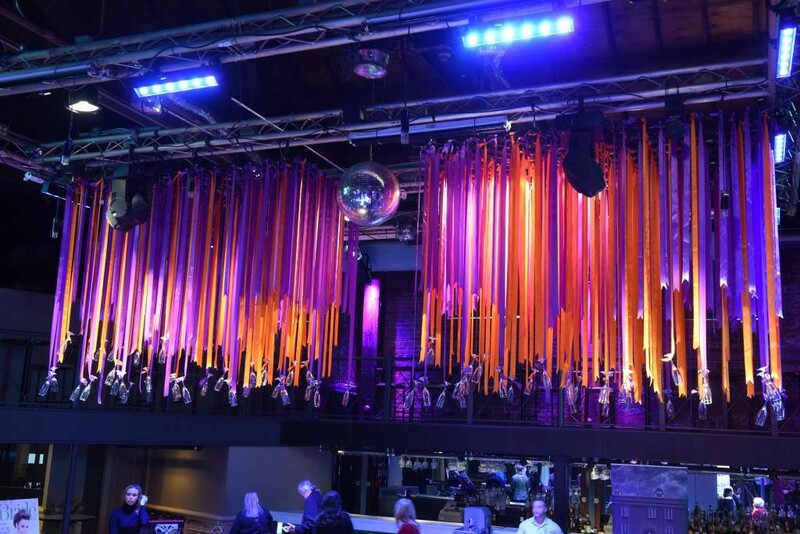 (For private parties like the one in this feature, contact Chelsea O’Lansen at chelsea@catahoulahotel.com). Wednesday: ​4 to 10 p.m., with a movie screened at 7:30 p.m. | Thursday: 4​ to 10 p.m. | Friday and Saturday: ​4 to 11 p.m. Happy Hour is Wednesday thru Friday from 4 to 7 p.m. Specials include wine, beer, a seasonal frozen cocktail, a Peruvian take on Sangria, and more. Pop-up kitchens start serving food at 6 p.m.
1. Combine in a shaker tin. 2. Shake once (hard) with ice, discard ice and shake again without, then double strain into a coupe or Nick and Nora and garnish with Angostura bitters and an edible flower. 1. Combine in a rocks glass. 2. Top with about 2.5 oz of Fentimans Rose Lemonade and garnish with a few skewered, fresh raspberries. This drink can easily be built for a crowd. Just multiply the recipe by 4 and build it in a pitcher. 2 packages extra firm tofu, drained and pressed. 1. Preheat oven to 400 F. Pulse peanuts and sugar together until finely ground like the sugar. Set aside in bowl. 2. Rub spices onto tofu and then place in oven on sheet pan for 30 minutes. Take out and slice each tofu blocks into 10 thick pieces. 3. Sprinkle kosher salt over garlic cloves and chop until minced. Let sit for a couple of seconds. Next place garlic in the warm water and mix. Strain garlic but leave behind garlic water. Mix sugar, garlic water and vegetarian fish sauce together to make caramel. 4. Heat grapeseed oil over medium high heat in wok. Add half of tofu and half of caramel. Turn until cooked golden brown on each side. Should be sticky. Repeat with remaining tofu and caramel, place on plate. 5. Steam Bao buns in a steamer basket until soft. Dress buns to impress in this order: Hoisin, cilantro, caramelized tofu, cucumbers, roasted peanut sugar and sesame seeds. Repeat with all buns and serve to your hungry guests. 1. Put 2 cups of flour in a large bowl and add the warm water to it, slowly while mixing with chopsticks until the dough is a little sticky. You may add 1 tablespoon more water if the dough is a little dry. 2. Put dough onto lightly floured wooden cutting board and knead until smooth. Make sure to flour your hands since the dough will be a little sticky. Put dough in a clean bowl and cover with damp towel for 30 to 45 minutes. 3. After resting, put dough onto floured surface again and break into 4 dough balls. Place under damp towel. Gently roll each ball into a 9-inch round, brush with oil, and sprinkle a quarter of the scallions in the middle. Sprinkle with salt. 4. Next, roll the dough into a long spiraled rope and wind it around itself like a cinnamon roll. Use the palm of your hand to push down on dough to flatten. Roll out the dough again into an 8-inch round. Don’t roll too much or scallions will break out of the dough. Repeat with 3 last remaining dough. 5. Heat the oil in a cast iron skillet over medium high heat (be careful not to burn). Pan-fry each pancake individually. Make sure to press down on each side for crispness. Cut into 4 wedges and drizzle with sweet soy sauce immediately. These pancakes are the perfect party pleaser. You can use it like a wrap and use various fillings or just do like we do and eat these by themselves, because they’re that perfect. 1. Bring special flower arrangements. We used a fun gold ceramic pineapple vase to tie in with the summer theme, and added a potted plant for the pineapple “top.” Do these ahead of time at home and bring them to the venue. We also added potted succulents from the garden center. 2. Use wooden picnic style utensils and chopsticks with small bamboo plates. 3. Fun paper cocktail napkins for drinks, and cloth napkins for food service are an easy addition to bring to the party. 4. Use the bar as a serving station with dishes presented on platters family style. 5. Choose two special signature cocktails to be served. 6. Focus the number of dishes to be served to a special few. Chef Melvin Stovall chose four. 1. Wash cucumbers and dry with towel. 2. For the fun part: use a large Chinese knife or rolling pin to smash all the cucumbers on a wooden cutting board. This will be messy but worth it. You can also put on gloves and rip the cucumbers with your fingers. 3. Mix cucumbers in a large bowl with all of the ingredients. Tossed well and add more salt or sugar to taste. Serve with sesame seeds and cilantro for presentation. Once you get on the smashed cucumbers train, you’ll never want to leave. Made for the summertime as a refreshing, cold break from those humid days. Only takes about 10 minutes to make. 1. Mince garlic and bird’s eye chilies together. Put aside in small bowl. 2. Heat oil in wok on high heat and throw in onions, snap peas, bell pepper, cherry tomatoes and oyster mushrooms. Cook for 5 minutes. 3. Next, throw in noodles and garlic-chili mix. Cook noodles until soft. Put in 6 of the basil leaves. 4. Add rice vinegar, white pepper, soy sauce, and vegetarian fish sauce. Sprinkle a little sugar in to help caramelize the noodles. Cook until noodles are dark brown. 5. Plate noodles and place the last Thai basil on top.